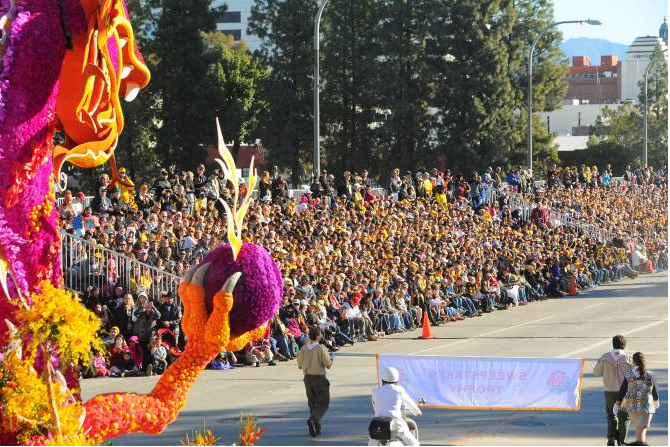 Rose Parade in 2016. Photo via www.tournamentofroses.com. 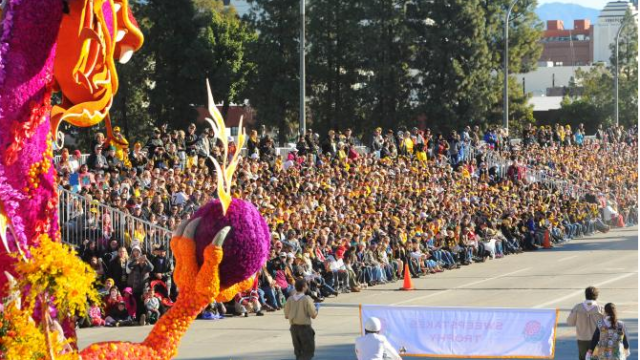 The 129th Rose Parade stepped off on time in a peaceful and festive Pasadena Monday, with 24 awards given to floats and a B-2 bomber soaring overhead. Three massive flowered wheels, pushed down the parade route by human beings, won the Crown City Innovator Award for most outstanding use of imagination, innovation and technology. That float, “Make Your Own Momentum,” was sponsored by “The Grand Tour,” an Amazon TV show. Volunteers from Burbank won the Founder Award `Sand-Sational Helpers, named the most outstanding float built and decorated by volunteers from a community or organization. Other self-built floats winning awards came from Cal Poly campuses, Downey, La Canada-Flintridge and Sierra Madre. It was a quiet night in Pasadena, as quiet as could be expected with tens of thousands of people on Colorado Boulevard and side streets, both welcoming the New Year and staking out prized parade viewing concrete. Actor Gary Sinise, best known for his role as Lt. Dan Taylor in “Forrest Gump,” will serve as grand marshal of the 5 1/2-mile procession, which will begin at 8 a.m. The parade featured 39 floral-covered floats, 20 equestrian groups and 20 marching bands, plus the marching bands from Oklahoma University and the University of Georgia,. Among the marching bands taking part were Australia’s Marching Koalas; Kyoto Tachibana High School from Kyoto, Japan; Banda De Musica Herberto Lopez of Panama; the Los Angeles Unified School District All District High School Honor Band; the U.S. Marine Corps West Coast Composite Band; and the Burlington Teen Tour Band from Burlington, Canada. La Salle High School senior Isabella Marie Marez, 18, presided as this year’s Rose Queen. She was accompanied by Royal Court members Alexandra Marie Artura, Savannah Rose Bradley, Lauren Elizabeth Buehner, Georgia Jane Cervenka, Julianne Elise Lauenstein and Sydney Grace Pickering. The highlight of the parade, however, is always the array of intricately designed and decorated floats. This year’s lineup includes floats sponsored by a variety of Southland cities, along with groups and companies including the AIDS Healthcare Foundation, Honda, Dole Packaged Foods, Kaiser Permanente, Lucy Pet, Trader Joe’s and Shriner’s Hospital for Children. The Donate Life float, an annual fixture in the parade, will again pay tribute to organ donors. Among those riding on the float will be baseball Hall of Famer Rod Carew, who received a heart and kidney from the late NFL tight end Konrad Reuland, and former NFL quarterback and coach Sam Wyche, who received a heart just hours before being placed on hospice care. A float by the United Sikh Mission will feature a replica of the world’s largest free kitchen, which is located at the Golden Temple in Amritsar, India. Once the parade concludes, the floats will be on display until Tuesday during the Showcase of Floats at Sierra Madre and Washington boulevards. Parade-goers will notice a stepped-up presence of law enforcement officials. Police took the added step this year of closing off the parade route earlier than usual, with barricades going up at 10 p.m. New Year’s Eve in an effort to better control traffic through the area. Bomb-sniffing dogs, a “no drone zone” and barricades blocking vehicle traffic from entering the parade route at its 56 intersections are all part of the security plan.